I have the universe at my feet. To be precise, it’s 16m below my feet, and to be even more precise it’s a thirteenth century representation of the universe – which is to say it’s beautiful but completely inaccurate. This, however, is one of the greatest views in world architecture. Straight down the nave of Westminster Abbey, the pointed arches of its Gothic roof vault marching away in front of me, and below me, the Cosmati pavement: the ornate, geometrical, highly symbolic flooring in front of the High Altar, made from hand-cut fragments of semiprecious stones, commissioned by Henry III from Italian artisans when the abbey was built and the ground upon which monarchs have been crowned from the medieval period onwards. Very few people have seen this view for centuries. But that is now changing. The Queen’s Diamond Jubilee galleries are located in the Abbey triforium: a structure which helps support the weight of the roof at the top of the nave. For many years, it was used as storage for a variety of items encompassing both treasure and junk and was inaccessible for anyone except Abbey staff (apart from when it was used as a gallery during coronations). 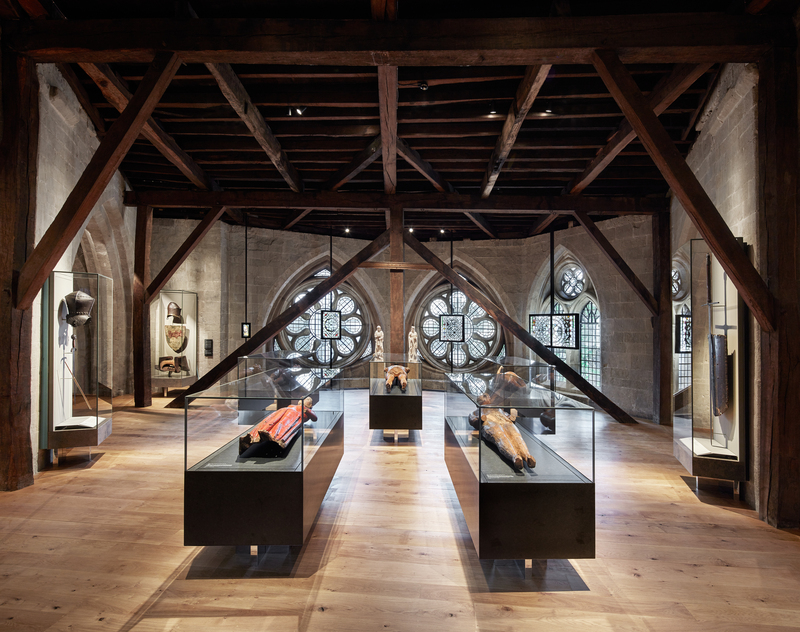 But now, it has been transformed into a space to house and display many of the Abbey’s greatest treasures. Accompanied by a new tower on the exterior of the Abbey, wedged into an angle between the 12th-Century Chapter House, one of the oldest parts of the building, and the 16th Century Lady Chapel, built to house the tombs of Henry VII and his queen, the tower contains a staircase and lift to access the gallery. 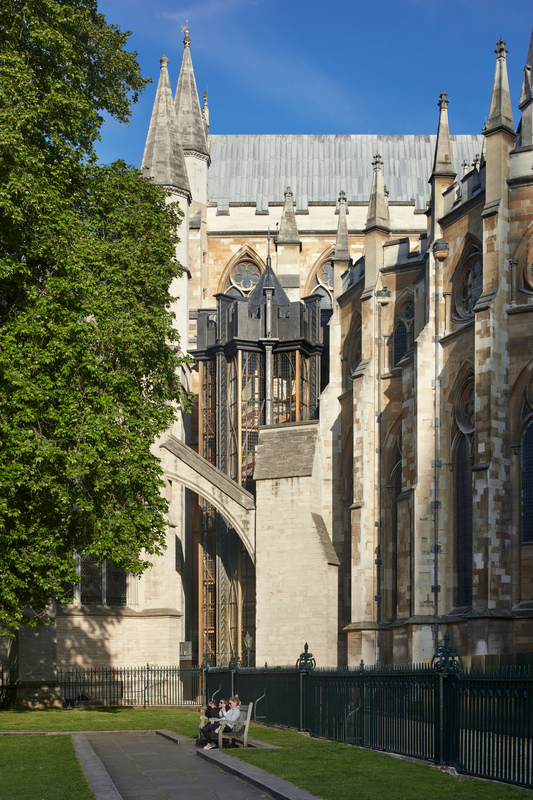 This represents the first major structural addition to Westminster Abbey since the 18th century, when the two towers that adorn the West Front of the building were added giving it its famous and characteristic façade. The Abbey is a combination of national shrine, tourist attraction (which it has been for centuries) working church and historical monument. How does a modern architect and team of engineers go about making additions to such a building? How do you preserve the character of an eight-century old structure? And how do you convert such a space into a modern gallery with all its needs of access and services, while ensuring that its contents can be viewed while also conserving them? It’s quite a task, and one that fell to Ptolemy Dean, an architect who rejoices in the title Surveyor of the Fabric (following in the footsteps of such illustrious names as Sir Christopher Wren and Nicholas Hawksmoor) and his practice, which specialises in conservation and historic buildings. Ptolemy Dean Architects was aided by structural engineers at Price & Myers, who worked on the tower (called the Weston Tower) and the Max Fordham Partnership, a services engineering practice that also specialises in historical and significant buildings, which worked on the lighting in the tower, on controlling the conditions in the gallery and on modelling how light falls within the triforium to inform the design of the galleries themselves, which was carried out by museum specialist architects at the practice MUMA. It’s an impressive team assembled for a job that will have to stand the test of time. And a highly impressive piece of work it is. The Engineer is not the place for a museum review, but is impossible to write about the engineering of the spaces without discussing them and the impression they give. The tower is on the far side of the Abbey from Parliament Square, and therefore only visible if you make the effort to walk around the back of the Abbey and look deliberately. Make the effort. Constructed of steel and glass, with the steel covered in lead sheathing, it is strikingly modern, but the ornate and complicated geometry of the many glass panels fits in with the stone carvings and stained glass surrounding it without it looking like one of the City of London’s steel and glass monoliths. Despite the contrasting materials and styles, it has a subtle presence and doesn’t scream out as being a modern building intruding into its medieval surroundings. The tower is capped with a glass and steel crown and parapet, which refer to the pinnacles around it without trying to be a pastiche. Inside the tower, the stairs rise between the glass wall and the stone-clad lift shaft, with the views of the stone outside echoing the stone inside. At the top of the stairs, a short bridge leads into the Diamond Jubilee gallery itself and is the only point where the tower construction actually touches the original stones of the Abbey, piercing Christopher Wren’s outer facing and passing through the thickness of the wall. In the walls of the bridge are more windows, into which are embedded fragments of centuries-old stained and painted glass that were found when the triforium was cleared. It’s an elegant way of displaying these relics while also retaining their function. The gallery itself is a squared-off U-shape, stretching from a point above Poets’ Corner (which is where the tower is accessed) around the high altar and down the other side of the nave, ending roughly above the graves of Sir Isaac Newton and Prof Stephen Hawking. 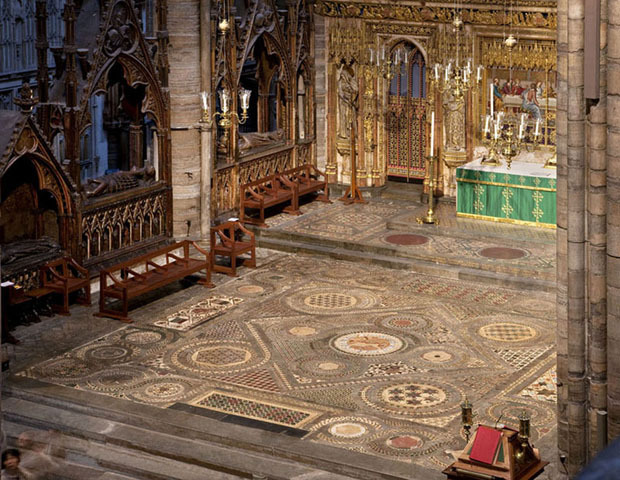 The sides facing into the Abbey are open, affording those marvellous views down the nave, onto the Cosmati pavement and into the sanctuary behind the High Altar where the tombs of Edward the Confessor and many of the Plantagenet kings are housed. This part of the Abbey is now closed to visitors apart from those who wish to pray because it is so delicate, so this is the only chance that most visitors will get to see into it. The walls on the other side of the gallery hold the Abbey’s huge stained glass windows. The gallery contents include architectural models of proposed additions to the Abbey that were never built, made by Christopher Wren’s master carpenter; the effigies of monarchs buried in the Abbey, which were dressed in their robes and carried at their funerals; documents relating to the Abbey, one of the thrones used for the joint Coronation of William III and Mary II (the Coronation Chair is on display downstairs in the main body of the Abbey), treasures such as the book used to direct Coronation services, and many other relics including carvings found in the debris of the triforium, medieval monks’ belongings and some scale models used for new carvings of modern-day martyrs now on the West Front of the Abbey above the door. 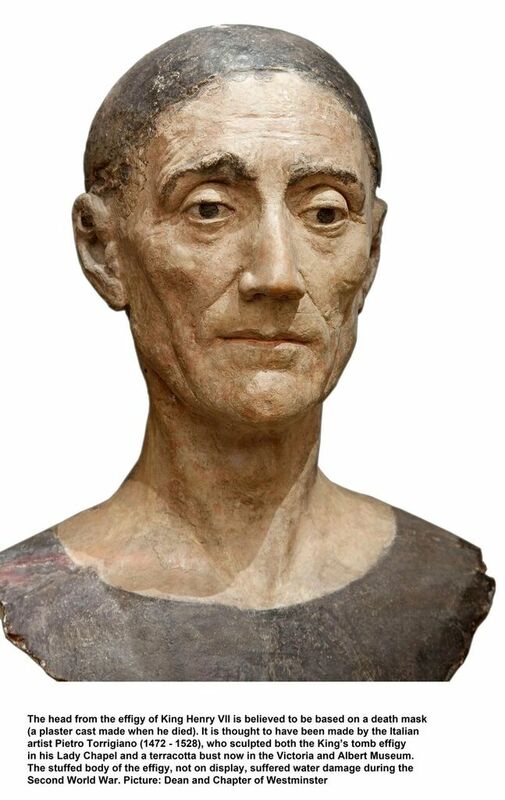 The funeral effigies are particularly eerie: the older ones are life-size jointed wooden dolls, and the surviving terra cotta head of the effigy of Henry VII by the Italian Renaissance sculptor Pietro Torrigiano is spookily lifelike and, being made from a death mask, shows the drawn face of a very ill elderly man, making it oddly moving (Henry is believed to have died of respiratory diseases; Torrigiano also made the effigies of Henry and his Queen on the tomb itself, but this is a more healthy-looking Henry). The later effigies are waxworks, and exact likenesses: Charles II is a surprisingly imposing and tall figure in high-heeled shoes, an enormous wig and a top hat; the elderly Elizabeth I bears a slightly alarming resemblance to Margaret Thatcher, and Admiral Nelson (who is buried in St Paul’s Cathedral, but Westminster Abbey bought the effigy in 1805 to attract tourists) looks like the wiry, tough and formidable man he undoubtedly was, rather than the slightly ethereal figure he sometimes cuts in contemporary portraits. Very noticeable are the stunningly rich colours of the robes in which the effigies are dressed: you have to remind yourself that these items are centuries old and not modern reproductions. 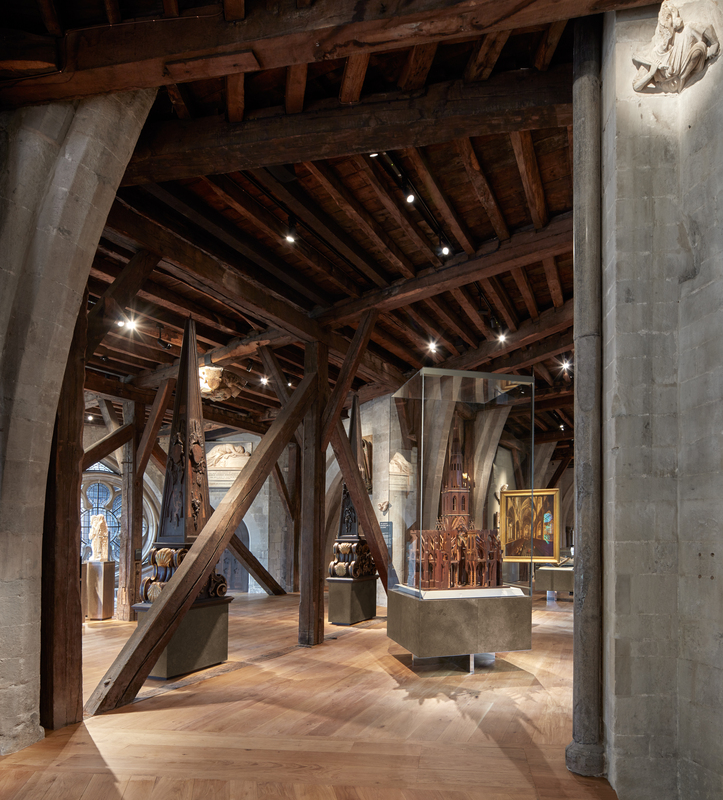 The gallery feels like a welcoming, open and airy space, despite the ancient surroundings and exhibits being positioned among massive oak beams installed by Christopher Wren when he was surveyor of the fabric to help support the roof. Everything is well lit, with natural light flooding in from both sides, and the atmosphere is unmistakably that of a church. Numbers allowed inside the gallery are restricted, so looking down on the tourist-crowded and bustling Abbey floor (I visited on one of the busiest days of the year) underlines just how peaceful the gallery is. It was also blessedly cool despite the sweltering summer heat outside. It’s certainly an impressive and appropriate space, both in the tower and in the gallery. The only thing that strikes a questionable note is the name. 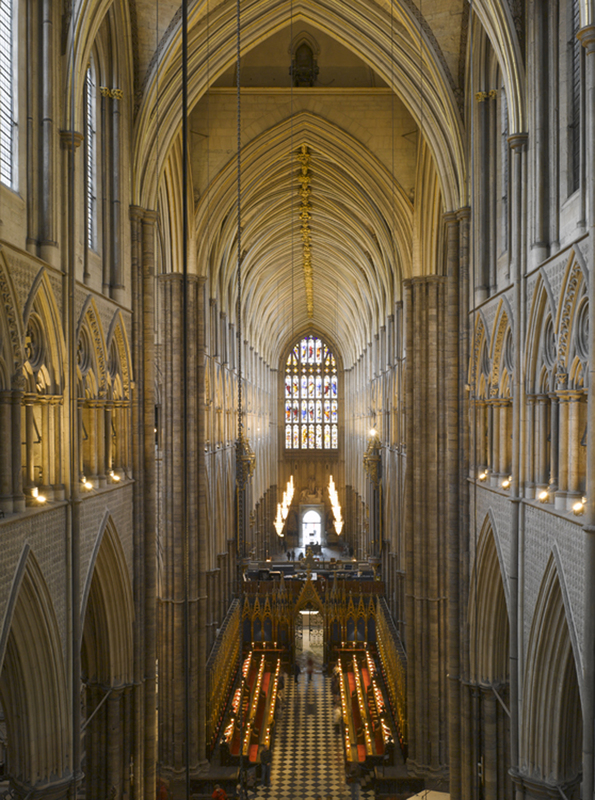 “The Queen’s Diamond Jubilee gallery” might be fitting during Elizabeth II’s lifetime, but one thing that Westminster Abbey above all other places emphasises is that even the lifetime of monarchs is finite. In a building which holds the mortal remains of four ruling Queens and the wives of numerous kings, might the name have to be changed to make it clear which Queen was being referred to? THE Abbey is a place to visit time and time again, both to confirm the wonder of your last visit and find the sights you missed previous-much, much more than a place of history and worship. Wonderful atmosphere………. stunningly rich colours of the robes in which the effigies are dressed: you have to remind yourself that these items are centuries old and not modern reproductions. There are many modern dyers (and their customers) who would dearly like to be able to create modern dyed fabric with the same colour-fastness that was available in the 13th Century and earlier. Of course it was only those at the very summit of society who would have access to these old standards of dye: most of the population were dressed in ‘natural’ shades: and all the dye-stuffs which created these very bright colours would have been from vegetable or animal sources. Perhaps this is why they have survived.